(PhysOrg.com) -- Cancer patients may view their tumors as parasites taking over their bodies, but this is more than a metaphor for Peter Duesberg, a molecular and cell biology professor at the University of California, Berkeley. In a paper published in the July 1 issue of the journal Cell Cycle, Duesberg and UC Berkeley colleagues describe their theory that carcinogenesis  the generation of cancer  is just another form of speciation, the evolution of new species. Duesbeg's arguments derive from his controversial proposal that the reigning theory of cancer  that tumors begin when a handful of mutated genes send a cell into uncontrolled growth  is wrong. He argues, instead, that carcinogenesis is initiated by a disruption of the chromosomes, which leads to duplicates, deletions, breaks and other chromosomal damage that alter the balance of tens of thousands of genes. The result is a cell with totally new traits  that is, a new phenotype. Key to Duesberg's theory is that some initial chromosomal mutation  perhaps impairing the machinery that duplicates or segregates chromosomes in preparation for cell division  screws up a cell's chromosomes, breaking some or making extra copies of others. Normally this would be a death sentence for a cell, but in rare cases, he said, such disrupted chromosomes might be able to divide further, perpetuating and compounding the damage. Over decades, continued cell division would produce many unviable cells as well as a few still able to divide autonomously and seed cancer. 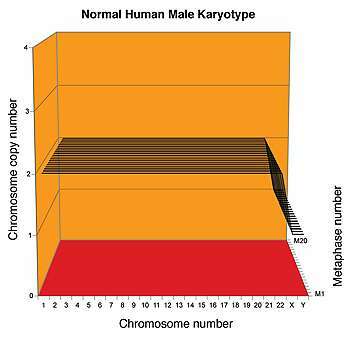 "If humans changed their karyotype  the number and arrangement of chromosomes  we would either die or be unable to mate, or in very rare cases become another species," Duesberg said. But cancer cells just divide and make more of themselves. They don't have to worry about reproduction, which is sensitive to chromosomal balance. In fact, as long as the genes for mitosis are still intact, a cancer cell can survive with many disrupted and unbalanced chromosomes, such as those found in an aneuploid cell, he said. A similar theory that I heard about maybe 10 years ago made me think that cancer is the last (nuclear) option of the immune system to a perceived threat, try like hell to evolve away to survive the threat? This distorts the purposeful, basic concept of a species being at it's core a set of interbreeding organisms (sure there's asexual species, but cancer isn't even asexual it's just cell division with consequentially variable genetics). Cancer is not a biological species, it has no life history. You don't have to call cancer a species to fit genetic digression into our understanding of it's mechanisms. No, I'm quite comfortable with the accuracy of classifying cancer as cancer. Frankly this seems to me more an attempt at sensationalism then trying to progress a greater understanding. Frankly this seems to me more an attempt at sensationalism then trying to progress a greater understanding. Duesberg? A sensationalist? Who knew? BTW, check the comments on Duesberg on the RATE MY PROFESSORS website, they're -- ahhhh -- interesting. It has been pointed out that if we regard a multicellular organism as a "metacolony" of cells, then there will always be an option for one line of cells to "cheat" and exploit the collective for its own advantage. But since that generally destroys the collective, it's quite literally a dead end. As Dawkins puts it, relative to his often-misunderstood "selfish gene" concept: "Nice guys finish FIRST." This distorts the purposeful, basic concept of a species... ...this seems to me more an attempt at sensationalism then trying to progress a greater understanding. An individual cancer in no way meets any definition for species, as it has to be a perpetuating lineage composed of many related individuals that reproduce. We do not call people with down syndrome a new species, and we do not call sterile hybrids new species. Since virtually every cancer is a dead end, it does not meet the definition. However, the few communicable cancers they mentioned do warrant the conversation, and frankly open up fascinating and disturbing possibilities. It's this kind of close minded thinking that has prevented us from gaining knowledge, we consider different virus and bacteria as different species. Maybe you forget that all life on this planet started out as single celled asexual species and we are but a "cancerous" mutation of that. Not to say we are parasitical except that we must eat other organic life forms, like cancer. I wouldn't go so far as to say all cancers are unique species but some definitely are. HeLa would be THE example. A human/virus hybrid. I like first comment, seems plausible. I mean where do viruses come from? Considering they are just complex RNA fragments with coding proteins it would make sense that they are just mutations of existing organisms, like cancer only they developed independence to a higher degree (like the transmissible cancers mentioned in the article). I mean how is a transmissible cancer even possible unless this theory is correct, we thought it was damage to our own cells that made it compatible enough to live in us but if cancer can be contagious in a small non-diverse population then we need to rethink much of out cellular biology when it comes to relating micro-organisms to macro-organisms, like how we deal with prevention of creating superbugs and the pathology of long term organism evolution. 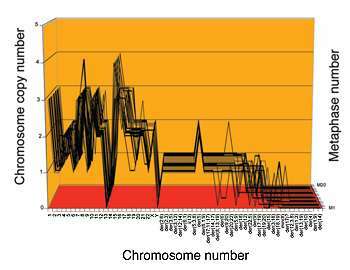 At a rate of one generation per minute some bacteria can evolve at an unprecedented rate. One generation per minute?? I think you might be thinking of viruses. AFAIK 15 minutes is close to the lower limit. I agree, I have never heard of this before.. The people arguing against this based on the definition of a species are basically ignoring how the vast majority of the prokaryotes reproduce. I'd like to point out that many people are arguing on several points on the definition of a species. Most cancers cannot carry on their lineage without the 'host' continuing. But the cancers kill the host. for a parasite like that to continue, it would have to be in some way independent of it's host, and capable of finding another host to exist as a species. Asexual reproduction results in separate organisms, with separate life histories, new generations. Division of cells in asexual reproduction is binary fission - horizontal gene propagation, cancer I'm pretty sure is just mitosis - cell replication/division. There is a difference. Not to mention budding. Cancer isn't a species in the classical sense, period. Not even HeLa. Separate from a victim, cancer has to be propagated on purpose. Cancer is not a parasite. It's not a separate organism. It's cancer. There's a difference between close minded and denying a statement based on a fallible premise. I am not close minded. This study, and you, are misappropriating defined terms towards no productive end. Calling cancer a species doesn't increase our understanding of cancer, it only makes species a less meaningful more dilute term. The transmittable cancers may have a valid argument, I don't know enough (anything) about them to say much one way or the other. It'd have to be cancer cells themselves that are transmitted and continue to propagate to consider it. Ultimately, for it to be able to be said that cancers evolve and are a species, IMO, the genetic changes have to make them more likely to reproduce - lead to a higher fecundity. Cancer (except maybe the transmittable ones) can't be said to have the biological characteristic of fecundity. Part of my unwillingness to accept cancer as a species also comes from a desire not to confuse the public. Go ahead and say cancers can have, distinct/stable genomes, that's true that's fine, but this doesn't make it a darwinian species. Cancer isn't a species in the classical sense, period. Not even HeLa. Separate from a victim, cancer has to be propagated on purpose. HeLa survives outside of a host, does it not? In fact, is HeLa not notoriously difficult to kill once it roots itself in a lab? HeLa is also transmissible with great effort (implantation). I guess I was including media as a "host", but all I know about it is what I heard on NPR so I probably shouldn't have spoke there cause I really am not too well informed on it's properties. is quite incorrect. Certainly this is true of all higher animals that I'm aware of but in the plant world, at least, hexaploidy and octoploidy (6 & 8 copies of each chromosome, respectively) and other multiples are not uncommon (I've personally seen up to 14-ploid; don't know what you'd call that and admittedly that high *is* a bit unusual). Nor are triploidy and aneuploidy although often, but not always, these are reproductively inviable. When these organisms are viable and produce offspring the karyotypes are most definitely stable and may carry forward the chromosomal variation. *Edited to fix a typo. If we have a new self-maintaining lifecycle, then I think by definition we have a new life form. If we have a new life form, we need a name for it, hence a new species. In that sense, it looks like the Devil Facial Tumor Disease ticks the required boxes. Not so sure about HeLa, but some military research facility somewhere could make have already made it happen. "Contagious reticulum cell sarcoma of the Syrian hamster, can be transmitted from one Syrian hamster to another by means of the bite of the mosquito Aedes aegypti. A malignant fibrous histiocytoma was contracted from a patient by a surgeon when he injured his hand during an operation." "that a single malignant clone of CTVT cells has colonized dogs worldwide. Thus the tumor has evolved into an independent parasite, which has long outlived its original host, possibly a wolf. CTVT represents the oldest known malignant cell in continuous propagation, and challenges the concept of increasing genome instability in cancer progression." "There are more things in heaven and earth, Horatio,Than are dreamt of in your philosophy."